This guy I know pretty well heard Macklemore for the first time about a year and a half ago. My speakerhead of a cousin had discovered him however he discovers soon-to-be-big artists (he listened to Wale back when people called him “Whale”). As soon as my cousin played “Thrift Shop,” my friend was hooked. What hip-hop fan wouldn’t immediately approve of Macklemore’s lyricism and delivery? His verses tumble over each other in a carefully crafted way. Plus he has a great hip-hop voice, which, let’s face it, goes a long way in this game. Imagine what Biggie’s songs would be like if his voice sounded like yours probably does. Anyway, my friend, who I won’t name for his sake, did what he always does when he discovers a new person or thing he likes: he Wikipedia’d the guy. That’s how he learned Macklemore was a white dude from Seattle. “Oh,” my friend thought, like a kid expecting a PS4 for Christmas but instead getting a game for his PS3. What a stupid reason to be disappointed. So what if Macklemore’s not black? Do all rappers have to be black? Are we now judging black and white rappers in separate categories? “He’s awesome for a white rapper, but only so-so compared to black ones.” Bogus. Some accused Gozamos of making a racial issue out of nothing, that we were acting like those other sites run by Latino liberals who find a reason to cry wolf every 24 hours. There was a fiery argument on the Facebook page and possibly some hurt feelings. So the editors had a little powwow this morning about the whole thing, and of course, we ended arguing with each other. If I remember it right, we first debated whether hip hop was a black and Latino thing or not. We all agreed that, to borrow from Chef Gusteau’s motto, anyone can rap. Whether hip hop’s soul was multicultural was something we couldn’t agree on. For my part, while anyone can be a great rapper no matter what their skin color is, hip hop is a black and Latino thing. In terms of who created it (blacks and Puerto Ricans in the South Bronx) and what the purpose it serves (“as an expression of poverty-stricken inner city minority youths“), hip hop has a color. Just jazz was considered “jungle music” during the first decades of its existence, hip hop is urban jungle music. And only two groups of people predominate in America’s crumbling inner cities. Even Eminem, the Great White Rapper himself, who’s compared himself to Elvis, thinks hip hop is a black thing. He said as much when he thought it important to point out that Source magazine was owned by white man back in 2003. Em knew hip hop’s core audience would have a problem with a reputable hip-hop magazine being owned by a white Harvard graduate. Don’t get me wrong. Macklemore is an amazing MC and The Heist is a great hip-hop album. But both he and his album beat a superior MC in Kendrick Lamar and his superior album, Good Kid, M.A.A.D City, and we have to ask ourselves why. Skin color has less to do with it than what each album signify, what each stands for. The Heist represents a push to make hip hop more peaceful, harmonious and understanding, and is more pop than actual substance, except for “Same Love.” The other hit singles, “Thrift Shop” and “Can’t Hold Us,” are essentially meant for the radio, pairing Macklemore’s excellent wordplay with Ryan Lewis’ excellent production. Oh, and for those that don’t know, don’t get it twisted; the rapper who brought you “Swimming Pools” doesn’t even drink himself. Even a song as seemingly immoral as that one still comes as criticism of current hip-hop culture. That’s why Drake called GKMC “the last great concept album,” and even if you’re not one to agree with Drake’s musical judgement, you can rest easy knowing plenty of other worthy critics seem to agree with him on this one. 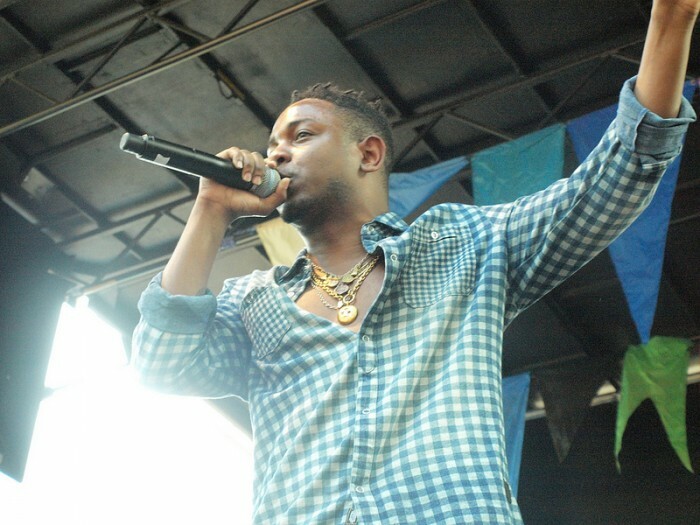 So, again, why did Macklemore and The Heist beat Kendrick and GKMC? As much as I hate to admit it, as much as I’d like to think the country has progressed past serious racial issues, race is still one of the underlying factors in American society — the others being class, gender and religion. Viewed in such light, it’s not hard to understand why the Grammy judges would favor Macklemore’s party-anthem album, even with its gay-friendly single, over Kendrick’s inner-city, racially-charged storytelling. The Heist is the safer choice. Meanwhile Malcolm is sans-holiday, because he was the dangerous one, the one who got a lot of blacks and other people all riled up. America doesn’t need anyone to remind the oppressed of just how oppressed they are. Just keep them dreaming. Considering Kendrick is the better MC with the better album, those same Grammy peeps seem to think he’s what rap (and the country) needs to get away from — a young black man who’s too pissed off, too riled up, and way too aware of it all.